Strategic Content Management - ABTACH Ltd.
is all that matters. We love to transform your ideas to money-making entities. Content Management is a challenge which demands logic and ingenuity in its highest forms. Our Content Management Services speak volumes about the dexterity that our content managers exercise in providing original and meaningful content thereby helping businesses spread messages across. 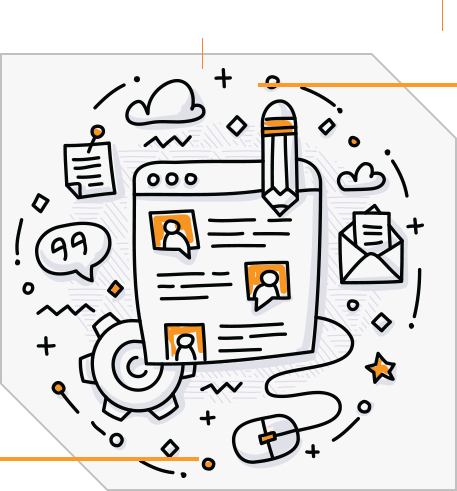 Our content developers are equipped with the perfect skillset to help deliver genuine and strategically designed content for your business needs. We are dedicated to provide creative and thoroughly researched content so that you can concentrate on reaching to the top without ever having to look over your shoulder. This is our take on digital branding; high-end designs, video animations, web and app development. ABTACH Ltd.’s successful designs are a direct result of our systemized design and development process. We Love To Share Our Facts. ABTACH Ltd. has achieved the status of the fastest emerging IT Company in Pakistan in a very short span of time. Our Company has experienced a fleeting success in its new and long-established ventures landing us with more business and growing profit margins each year. Our offices across the world are equipped with five specialist teams employing more than 300 employees whose dedication has led us to earn the loyalty of more than 21000 clients worldwide rewarding us with a 300% of business turnover in the current year and getting us a place among the Top 10 IT Companies in Pakistan. Over the years, ABTACH Ltd. has served many and inspired even more. With customer satisfaction as our foremost preference, our company digitizes workflow, encourages effective communication and works to save time. Here is what our clients say about us! ABTACH Ltd. has impressive people who turned up with all my projects in time. Their professional attitude towards customer dealing was definitely commendable. These guys are doing some amazing work! I worked with them for 6 months and in that short time, they really helped me through all the digital marketing issues that my business faced. Needless to say, my business earned a seamless support from ABTACH Ltd.! ABTACH Ltd. has IT professionals who are genuinely there to help you. I worked with the design team and they were really cooperative throughout my projects. I’m definitely recommending them to my friends! 08, Khaliq-uz-Zaman Road, Clifton, Karachi. 696 Weihai Road Jing'an District Shanghai.